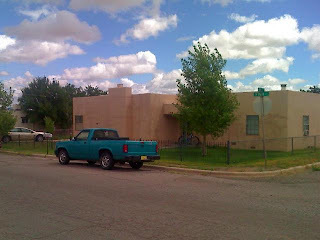 On August 1st 2003 Patti and I took possession of a 1600 square foot house in Lordsburg New Mexico. We were fortunate to have our offer of $50,000 accepted and we happily moved in. This house was built in 1949. It was a little bit smaller then, but over the years there have been a couple of additions that make it the house it is today. I have however learned that when you buy ANYTHING used you need to learn to be a handyman of sorts. Older houses require a little of attention every now and then, and of course Patti and I have our vision of what we want it to be... one of these days. One of there days, we are going to put on a new roof. I have been up on that thing many times looking for the most logical route that water would take to leak into our bedroom. Sometimes I find it and sometimes it takes trial and error. One of these days, we are going to get rid of our 1970 vintage shag carpet. Our carpet is a multi shade of browns and tans. Almost a camouflage pattern of browns. It made us very vigilant in Red's early puppy days, when looking for a warm surprises. One of these days, we are going to paint the exterior and the interior. The interior could use it to make it brighter and more colorful on the inside. 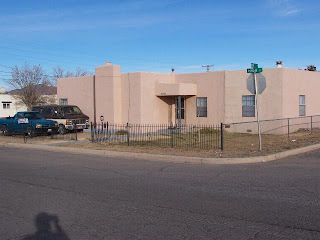 The exterior could use it for the same reasons and to seal some of the stucco repair that I have done and to seal cracks before water seeps in and damages the walls. One of these days, we are going to get a new furnace. The one we have (no lie) has the date 1962 stamped on the top. It still works as well as I guess it ever did, but I don't think that efficiency was a big priority back then. Or rather I don't think technology was as advanced then as it is now, because it LOVES to burn gas. One of these days, we are going to get a new cooling system. Currently we are cooling it with an evaporative cooler. It requires a lot of maintenance. I buy a new pump at least once a year, new belts at least twice a year, and a new motor...well this one has been going for 2 years (knocking of the closest wooden thing I can reach right now). The water here in Lordsburg has a lot of minerals and you would not believe the stuff that comes out of this cooler. It causes the pump to clog and burn up occasionally, especially if we turn it off for a few days. To keep the pump from doing this we tried not turning it off at all during the summer. OK... that has bitten us hard a few times. For instance when we went to Florida for two weeks, and came home to the pump over flowing onto the roof and causing some damage. It also flowed into the ceiling in our hallway so that when we came home from vacation, it looked as if we were going to Carlsbad Caverns with stalactites (minerals and drywall) hanging from the ceiling. Yes, we are getting experience. Kinda like the experience Tom Hanks had in the movie "The Money Pit". However, when we were looking for a house to live in, gasoline was about $1.50 a gallon. We were driving back and forth everyday from Silver City to Lordsburg. About 90 miles round trip. So there is a silver lining. Today it is $3.59, so the house is more than paying for itself in the gas money we are not spending now. We tried to buy a different house prior to finding this one. The bank was in the middle of checking our credit and getting a loan together, when the owner decided not to sell right now. He was in Iraq at the time. So we made the offer for this one, not knowing that the earlier credit check made our credit rating points go down. We asked for a 20 year loan at 7% interest. Everything was a go until the bank called us in because the reduction in point did not qualify us for the loan that we had arranged for. Upset, we went to the bank to rearrange the terms finding out that the interest rate had fallen over night and that we would now be getting 3% interest for a 15 year loan, since we no longer qualified for the 20 year making our payments a little under $400 a month. Another silver lining. Everything sort of fell together when we got this house, and I recognize the hand involved in the help. We have been in this house for 5 years now and in another 10 it will be ours lock, stock and barrel. We have made some changes and some improvements as we have gone along. Some of them out of necessity, and some just to make it ours. 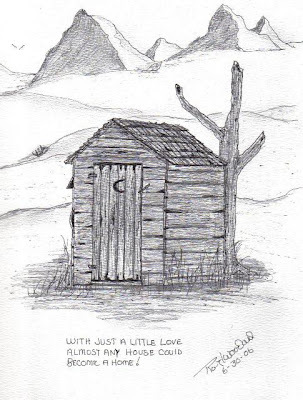 Most of all, despite the problems, the headaches, and the heartaches, it is home. We love it, and one of these days it will be ours, and it will be what we want it to be, but for now... it is sufficient, and we are happy. Guess you spoke to soon - Patti said you burnt out another pump this weekend! Makes life fun! never, Never, NEVER! Praise something. That is the curse. Some consumable voodoo curse for the proud. I have my car, it doesn't run well. Maybe that will reverse the curse. I love my old house. Ok so I want to change a few things. ONE day we will have money to do it.